Lice don’t belong in your home! Lice don’t belong in your home! I don’t even want to put a picture of them here! Lice are the size of a sesame seed and cling to the base of the hair at the scalp. They produce a sticky substance that just can’t be shampooed away. Kids will itch and scratch if they are infected. It’s that time of year and if you have kids in school you know all about lice. My good friend has 3 kids in elementary school. Throughout the year she will get emails from the school that there has been a case of lice and she should check her kids. She knows that prevention is better that trying to get rid of them once they are in your home. 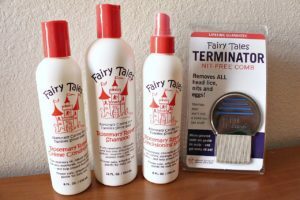 Joanna told me about Fairy Tales products. You can order them on Amazon or get them at Target and other stores like that. If you have kids in school, you need to add this to your morning routine! Fairy Tales products have rosemary as an ingredient and it’s a natural repellent. There is a shampoo and a conditioner. The leave-in conditioner can be sprayed on their dry hair in the morning before they go to school as an extra line of defense! Lice crawl and can spread to everything. They do not hop or fly. I always get a little itchy just talking about it! 🙂 Bedding, clothing, stuffed animals, coats, and even your furniture must be thoroughly cleaned. This is the treatment once you notice that lice are living on the hair strands of your kids. There is a special comb that helps remove the lice and their eggs. Treatments are easy to use. It’s always best to have them on hand so you can attack this problem right away! 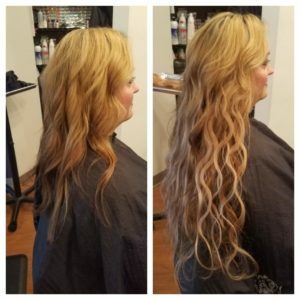 These are 22 inch long human hair extensions. They come in several colors, lengths and textures. Shelley has multi-dimensional, wavy hair. 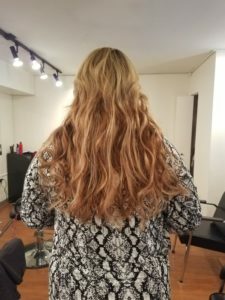 We choose 2 colors in a wavy texture and it matched perfectly with her own hair. The Tape-in hair pieces last about 3-4 months. They can be reused 2 to 3 times. They are easy to remove. A little solution is applied to the tape and it loosens the adhesive. This is the best method for preserving the health of your own hair. Many other extensions can pull out hair and even leave bare spots on your scalp. The hair is shampooed, dried and a new tape strip is applied. Shelley wanted all over length and fullness. We used 4 packs of extensions. That’s 40 pieces. 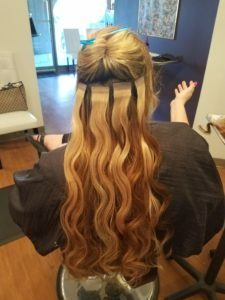 Two strips of hair extensions are sandwiched over a fine section of your own hair. The strip of tape is very flat so they are very comfortable. You can shampoo and condition like normal. There is a special loop brush that won’t pull on the extension. You should also refrain from using any oily products or serums. Shelley would’ve loved to keep all of that length! 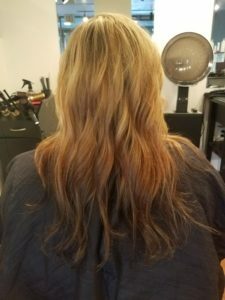 We trimmed the extensions to a more believable, manageable length. Now Shelley has the hair she’s always wanted. She can curl or straighten her new hair just like she would her natural hair. Shelley was all smiles for days with her new hair! We’re so happy for her!